Choose a page number then click on the arrow buttons to hear the tunes in this book. This beautifully illustrated book contains a joyful collection of children’s favourite carols, including “Silent Night”, “While Shepherds Watched Their Flocks”, “Away in a Manger” and “We wish you a Merry Christmas”. The words to each carol are clearly displayed verse-by-verse, so that young carol singers can easily follow the words and you can listen to all the tunes at the Usborne Quicklinks Website. 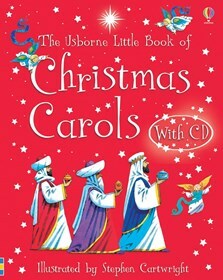 Colourful Christmas images adorn each carol, created by one of Usborne’s most popular illustrators; Stephen Cartwright.